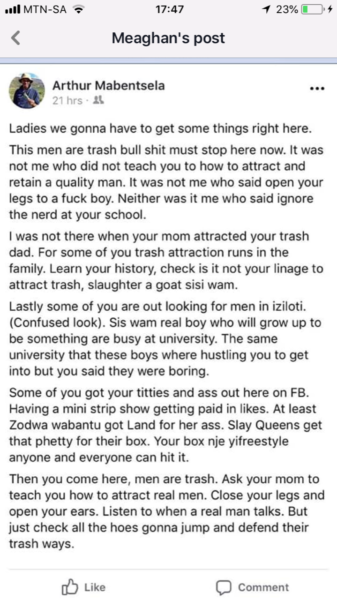 University of Cape Town takes action after engineering lecturer’s controversial Facebook posts about the #MenAreTrash movement. A lecturer at the University of Cape Town (UCT) was called for a pre-suspension hearing on Wednesday, August 15, following comments he made in his personal Facebook account. The university has confirmed that the lecturer is not currently teaching students and has distanced itself from his comments. 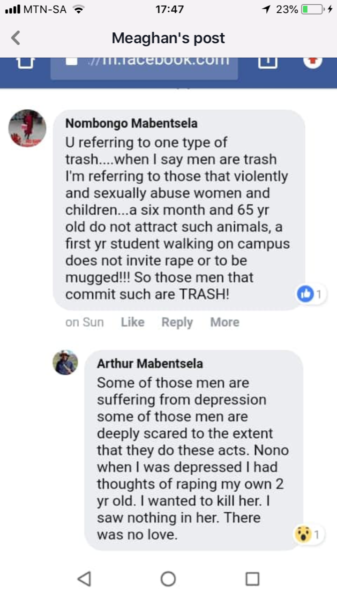 Earlier this week, Arthur Mabentsela, a chemical engineering lecturer, posted comments about the #MenAreTrash movement that were derogatory towards women on. “Ask your mom to teach you how to attract real men. Close your legs and open your ears,” Mabentsela advised. UCT published a statement on Tuesday, August 14, condemning Mabentsela’s comments, and stating that the executive management had already met with the lecturer and had called a formal pre-suspension hearing to investigate the matter. “The content of the post is grave, unacceptable and disturbing, and completely out of alignment with UCT values,” the statement read. However, in a now deleted Facebook comment later that day, Mabentsela denied being contacted. “No one met with me yet. Confused,” he wrote. UCT released a second statement on Wednesday, confirming that Mabentsela had been contacted and that the university had begun formal disciplinary proceedings against him. He had been called in for a disciplinary meeting that morning and his case was being considered by the vice-chancellor. “The university is dealing with the matter urgently by following the appropriate Employee Relations legislation and the UCT Human Resources policies. “UCT distances itself from the post and subsequent comments made by the staff member,” the second statement read. Facebook user, Meaghan Essel, created a widely shared Facebook post on Tuesday, with screenshots of the the lecturer’s posts asking UCT and the Khayelitsha Engineering Society, of which Mabentsela is president, whether the his views were representative of their values. “Do you think your students are safe, if his 2-year-old isn’t even safe,” she wrote. Essel told Wits Vuvuzela that she was alerted to Mabentsela’s comments by friends of hers who showed her screenshots thereof. She said she became concerned by the content, searched for Mabentsela’s details, and made contact with UCT’s Department of Chemical Engineering. Essel’s Facebook post became viral and received mixed reactions from people who commented on it. Essel says that while some expressed outrage and concern over the lecturer’s comments, others agreed with Mabentsela’s views towards women and were concerned that the post would destroy his career. The most effective way for the institution to deal with Mabentsela would be to terminate his contract as a lecturer, Essel said. “Overall, I think most people identified that he battles with depression and that he needs help, but not everyone agrees on how to handle such a disturbing issue. However, his depression does not excuse his views on women. “At all costs, we need to protect women and children. We cannot excuse toxic behaviour because of someone’s accolades,” she added. Mabentsela has been lecturing at UCT’s Department of Chemical Engineering since 2015 and is a staff member of the UCT Centre for Minerals Research. Wits Vuvuzela contacted him for comment but had not responded by the time of publication.